Becky at The Bookette has started a campaign to get this book back in print. All information about this can be found here. You can read her review or sign up for the tour here. 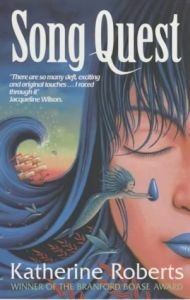 She is also hosting an awesome contest to win the second book in this series by designing a book cover for Song Quest. You can find all the details for that here. 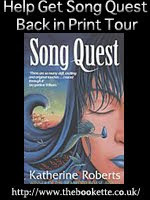 You can visit Katherine Roberts' website here. From Goodreads: Welcome to a world from another time -- where legendary half-creatures still exist. A world where nature itself can be controlled by unearthly music. A world where the forces of good and evil are held in harmony by the Singers who have mastered the secret Songs of Power. A world on the brink of destruction, threatened by a dark lord whose evil knows no bounds. Rialle and Kherron, two novice Singers, are all that's left to stand in the enemy's way. Stranded in a strange land with only one another to rely on, these former rivals must work together if they are to survive. In a timeless coming-of-age journey, Rialle and Kherron discover the strength of spirit that lies within them in their quest to help good triumph over evil. This is one of those books I really wish I had read when I was younger. As an adult it’s a book I really enjoyed but as a child I would have absolutely treasured it. I love Rialle from the get go. She came across as really caring and sweet, vulnerable yet strong and I really enjoyed spending time with her. I also adored Frenn - he was really kind and obviously cared a great deal for Rialle. I wasn’t sure how much I like Kherron in the beginning – but as the story progressed he really started to grow on me. I liked the dual aspect of the book – getting the story from Rialle and Kherron’s point of view. I do think I favoured Rialle as a narrator (possible because I liked her more) but the story definitely benefits from having the two points of view and gives it a appeal to both male and female readers. The story itself is great – many twist and turns and plenty of action. I found myself holding my breath in parts - either anxious to know what was going to happen or shocked by the turn of events. I found it completely unpredictable and loved that! I will admit this is a book that is slightly outside my comfort zone. Although I read many books that have fantasy elements in them I’m not usually very good at reading a ‘straight’ fantasy. There is something about all the made up names and places that confuses me. I believe it is testament to Roberts' writing that this wasn’t the case here. I found myself so completely immersed in the story that it wasn’t a problem at all. I would definitely recommend it for readers who are looking for their first fantasy read. Overall - Fantastic characters, a wonderful story and lovely writing. Brilliant! I'm looking forward to reading this! I'm like you in that I don't usually read full on fantasy but I've enjoyed recent steps out of my comfort zone. Great Review! Yah for trying Becky's recommendation! And yah for loving it! Great review. I'm not a major reader of straight fantasy either, but it sounds like that won't be a problem. Love a dual narrative too. I'm really excited to read this one. Wooo hooo! I am so excited for this review. It is FABULOUS! Thank you, thank you, thank you. I'm thinking this tour could move publishing mountains. And if there are people who wish to be a part of this tour, then please get in touch. The more the merrier. Thanks again Sammee! I am indebted to you!